I spent the last two days on school business building a set of common formative assessments in ExamView that are aligned to my department's skills list for our algebra and pre-algebra classes. 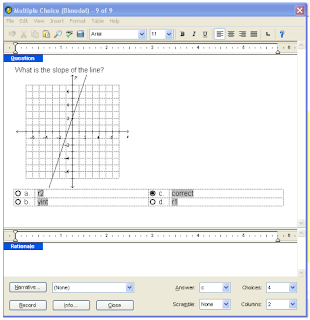 Many of the questions are dynamic which means that for any given question type, multiple versions of the question can be created by the click of a button. As I was looking through the question banks, I realized that there were some skills that didn't have questions that fit what we will be trying to assess. Solution? Build it yourself. The process is a bit tedious at first, but I was able to use previously made questions to figure out how to build a simple question regarding slope. Step 1: Define your algorithms. 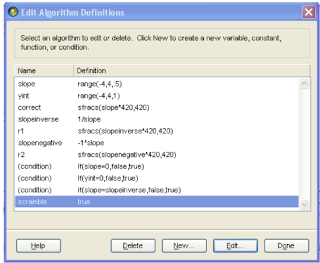 Step 2 : Create a graph using pre-defined variables. Step 3: Define the distractors. Of course, there may be some discussion on what the best misconceptions would be, but for the sake of practicing, those are what I went with. Step 4: Decide how many of these type of question you want in your assessment. I'm glad that I don't have to build all of these from scratch, but I like the fact that filling in the holes isn't too tough. Sorry, guys, I gave Wordpress a try, but it just isn't working out. I'm moving. New address is http://coxmath.blogspot.com. I hope you don't mind making the adjustment in your reader. Yesterday I had a few students absent and we did a lot of examples involving multiplying binomials, factoring and solving quadratics by completing the square. It was one of those lessons that "just happened." I had one idea I wanted to nail down and it kinda morphed into a bunch of examples. I made up most of the examples on the fly because I was just gauging their reaction and taking what they gave me. So believe me when I say, "they wasn't the pertiest lookin' notes ya ever did see." Apparently, they were effective, though. The countenance of the class went from chin-on-hand-it's-Friday-I'm-tired-here-we-are-now-entertain-us to thank-you-sir-may-we-try-another-cuz-this-is-some-cool-stuff-and-I'm-gettin'-it. Its tough to reproduce lessons like that so I exported the notes to .pdf and emailed them to the absent students. "Thanks for the notes! They will really help. I do have one question though; did you have to take time specifically out of the lesson to take the pictures or some other program that did them for you? I’m asking this because I think that if you did this every time we learned something new and posted it on your website[s], it would be a good resource." I have always taken a "students gotta take responsibility for their notes and review them regularly" kind of approach which has prevented my from exporting and posting the chicken-scratch covered slides from class. But if posting them is going to help them learn, should I care about the personal responsibility they take on (or don't take on) in regards to their own note taking? Note: if you're interested in what a spur-of-the-moment-ugly-as-heck-yet-equally-effective lesson in my class looks like on static slides, hit me up in the comments and I'll update the post with a link. I'm posting this from my phone and won't have access to the notes until Monday. Gotta thank Kate for introducing me to the Row Game. I also like the idea of using box.net as a way for teachers to upload and share them. But, me being me, I couldn't leave well enough alone. I like the fact that these activities are self checking and that if students find that they have different answers, then there is a mistake. The problem with that is if I create two sets of 10 problems, I would like my students to work as many of them as possible. So I introduced the "Easter Egg." I have used this concept in the past when doing test review. Basically, I hide wrong answers so students need are a little more alert when looking at the solution to a problem. How does this work for row games? Well, in the row game, if the partners have different answers, then someone messed up. This opens the door for discussion. But what if they never disagree? Then there was no real need to discuss anything. With the Easter Egg, I will make a couple of the problems diverge, that way agreement doesn't necessarily equal correctness. Now they have to talk even if they get the same answer. Today I rolled out this row game on slope with my 7th graders. Once they got used to the concept, the did pretty well. I look forward to doing more of these. I don't know, maybe this defeats the purpose of the row game. Maybe not. What say you? The move to middle school has really allowed me to consider not only why we do what we do, but why students do what they do. I had one such opportunity the other day during my introduction to quadratics. 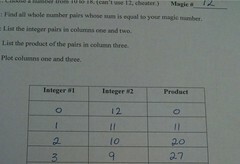 I gave my students the "magic number" worksheet where they choose a number and then select integer pairs whose sum is the magic number and place them in a table. The third column of the table is the product of the integers. Filling out the table took all of 30 seconds because my students are very good at following directions. Plotting the relationship between columns 1 & 3 went very smoothly as well. So smoothly that students were very nonchcalont about the symmetry of the resulting parabolas. Things got interesting when I asked them to give me an equation that represented the relationship between column 1 and column 3. It was interesting to me when I asked them what was happening in column 2. "4 + what = 12?" The answer's 8. Obvious. And they got this answer as if it were a thoughtless reflex. 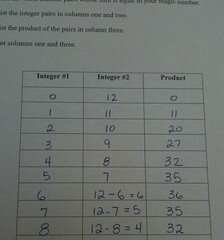 As long as column 1 contained an integer, there was no problem. However, this was no help when it came to generalizing an equation. As a result, many students struggled with going from the concrete to the abstract. "What's happening in column 2?" "Look again. Is it really addition?" "No, subtraction. You're subtracting in column 2." ...and then let column 1 be x?" "Ooooh, column 2 is 12-x." Recognizing what was happening in column 2 made finding the equation simple. The real problem was that there was a disconnect between what they thought they were doing and what they actually were doing. This led to a nice discussion on what I like to call "taking thoughts captive." Teachers call it metacognition. Students call it...well, they don't call it anything, because they don't usually realize they're doing it. Somewhere in there is the reason we get a shoulder shrug and an "I don't know" when we ask questions. But once they realize that they ask themselves questions hundreds (maybe thousands) of times each day, it's impossible for them to not think about it. 11:47am: I ask @rjallain if he has an effective way to demonstrate to students how the horizontal velocity of a projectile is not affected by gravity. 12:00pm: He sends me this link.